All workshops are 3 nights, begin on a Monday, and end on Thursday morning after sunrise and breakfast. LIMITED SPACE AVAILABLE! ALMOST SOLD OUT! July 9 - 12 (Monday - Thursday) - SOLD OUT! July 14 - 17 (Saturday - Tuesday) - SOLD OUT! August 6 - 9 (Monday - Thursday) - 1 spot left! August 13 - 16 (Monday - Thursday) - 2 spots left! This workshop will focus on all levels of landscape photography, but will have a focus on astrophotography with the Milky Way as conditions permit. This is the coast of Maine after all and clear skies are not guaranteed, but these workshops are scheduled around the new moon cycle so that we have moonless dark skies at night. This area is also a great place for dramatic sunrises and sunsets, with lobster boats, lighthouses, harbors, and rugged coastline as our foreground. There are also opportunities to photograph wildlife including bald eagles, seals, porpoise, as well as minke and right whales. Next to Lubec is Campobello Island, a part of New Brunswick, Canada. A bridge connects the island to Lubec. Bring your passport so you can go check out this beautiful island and its lighthouses! The schedule is roughly as follows but will vary depending on conditions - for example if we go out for the Milky Way all night we may skip sunrise. Please note that lunch (but not dinner) is included in your workshop price! Thursday: Meet at 4:15am for sunrise (optional as above), then breakfast, end of class. Lodging is included in the price of this workshop, and is provided at Cohill's Inn right in downtown Lubec, right near the water. We will also have our lunches and editing sessions here. Each workshop attendee will get their own private room with a queen bed. This is an outdoor nature photo workshop and being in relatively good health is best for the activities we have planned. There will be some hiking involved, maybe 1+ miles through the woods depending on conditions, so please be prepared with proper clothing. Please note that this workshop is in the dark and often along rocky and dangerous terrain. If you venture out onto rocks at the ocean's edge you acknowledge the risk you're taking. All participants are required to sign a risk of acknowledgement form at the start of the workshop. 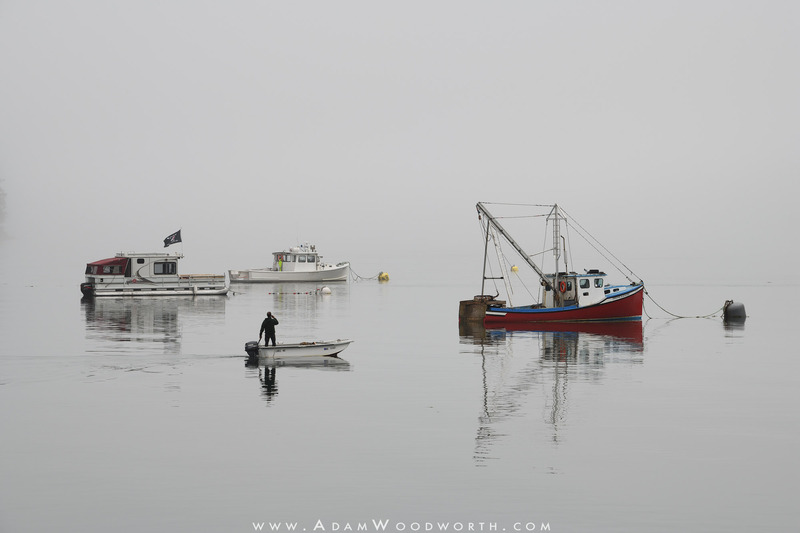 Adam Woodworth Photography, LLC, is not responsible for any injuries during this workshop. The price of the workshop does not include transportation, camera gear, or meals other than lunch. You are responsible for all of these. You must have the following items to take this workshop. Please do not book this workshop if you don't have the minimum equipment, refunds will not be issued if you arrive without the necessary gear. For the Milky Way, with full frame a 16mm or wider lens is recommended. The Nikon 14-24mm f/2.8 is highly recommended, and the Rokinon 14mm f/2.8 (Bower and Samyang make the same lens) is an excellent inexpensive manual focus lens but please test it to make sure you can get objects very far away in focus. Some copies are not able to focus properly - refunds will not be issued if you do not test your lens for infinity focusing prior to the workshop. For the Milky Way, with crop frame a 12mm or wider lens is recommended. The Tokina 11-20mm f/2.8 or Tokina 11-16mm f/2.8 lens is a good choice. Lots of fully charged batteries! Bring as many as you can. Don't forget the charger! Laptop for editing your photos. You MUST have up to date versions of Lightroom and Photoshop installed. External backup harddrive - I'd hate for you to lose your photos because your memory card dies or your computer crashes! I recommend making backups of your photos. Warm clothing - it can get very cold on the seacoast at night even in the summer! Bangor, Maine, is the closest major airport and there are rental cars available there. Lubec is about a 2 hour drive from Bangor. You could also fly into Portland, roughly a 4 hour drive to Lubec. A deposit of $500 is required to secure a space on this workshop. Full tuition is due 60 days before the workshop starts. A full refund minus a $100 processing fee is available if you cancel 60 days or more before the workshop starts. Within 60 days, we will only issue a refund (minus $100) if we can fill your spot. Night photography depends on clear skies, but sadly that is beyond my control! We will try our best to shoot every night of the workshop. However, I cannot offer refunds if the weather prevents us from seeing the stars at all. But I can tell you that you will come away with lots of knowledge for shooting and editing landscape astrophotography images! And we will also be focusing on sunrises and sunsets during this workshop. You must provide your own transportation. You will need to rent a car if you're flying into the area. Bangor, Maine, is the closest large airport. You can fly into there and rent a car to drive to Lubec, which is about a 2 hour drive from Bangor. Please fill out the form below to request your spot in the workshop. I'll check your equipment list to see if it will work for the workshop and I'll e-mail you back with information on how to pay the deposit online. You must be 18 years of age or older. By filling out this form you acknowledge that you understand the weather and cancellation policies. Which workshop date would you like? * Pick a dateJuly 9 - 12, 2018 - SOLD OUT! Waiting list only!July 14 - 17, 2018 - SOLD OUT! Waiting list only!August 6 - 9, 2018 - Only 1 spot left!August 13 - 16, 2018 - Only 2 spots left! If you are not comfortable with this please contact me to discuss how we may accomodate you at a workshop! What, if anything, should I know about your physical fitness or disabilities?